Francine played one of the women trying to get into shape at the ranch where Elvis worked in Tickle Me. The film’s credits list her as playing the part of “Mildred,” although at no time during the picture is she referred to by that or any other name. 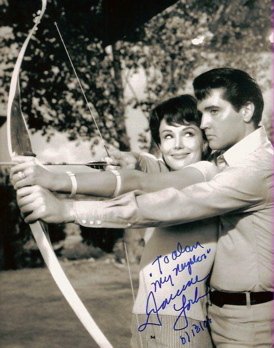 In her one close-up, Elvis gives her an archery lesson. Francine said several other scenes featuring her with Elvis were shot but not used in the movie. She can be seen often among the crowd of girls surrounding Elvis in Tickle Me. Since she had the booth directly to my left, I talked with Francine quite often. Like the other “Elvis girls” in the room, she has appeared in many other movies and TV episodes over the years and is still a working actress. Francine was very friendly with all the fans who crowded around her table. She did a brisk business selling autographed photos and posing for pictures with any and all who requested it. For some reason, though, she seemed restless at Elvis Expo. Over the two days, she often left her table, sometimes disappearing for a half hour at a time. 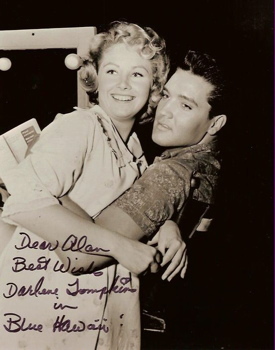 Darlene had a prominent role in Blue Hawaii as one of the four teenage girls, who, along with their chaperone, was escorted around the islands by Elvis. She played the part of Patsy, who enjoyed teasing Ellie, the spoiled teenager. Her table was directly behind mine, and a couple of times I walked around to her side to talk with her. She had a couple of her girlfriends with her, and they all seemed to be enjoying themselves. Like Francine, Darlene was very friendly with all those who came to her table. She seemed eager to talk with everyone and pose for pictures. She sold autographed photos of her with Elvis for the bargain price of $10. Tanya played the belly dancer in the “Little Egypt” segment of the Guitar Man production number in Elvis’s 1968 “Comeback” TV special. Like Francine York, through the years Tanya has appeared in numerous movies and TV episodes, including another belly dancer role in an episode of the original Star Trek series. In fact, Tanya had appeared at a Star Trek convention just prior to coming to Elvis Expo. Along with photos of herself on Elvis’s ’68 special, she also sells copies of her autobiography, Have Belly, Will Travel. Since her booth was right across the aisle from mine, I had plenty of opportunities to observe and talk with Tanya. Whether she was talking with fans, posing for pictures, or demonstrating some belly dancing moves, she clearly enjoyed being at Elvis Expo. These days she’s a writer/producer/actress and runs her own company, TanaVision Productions. I strongly recommend her web site, www.tanyalemani.com, where photos of her on the ’68 Special are posted and available for purchase. 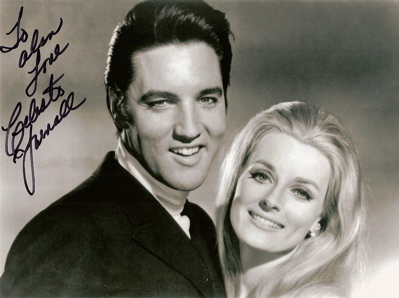 Like Tanya, Celeste Yarnall has connections to both Star Trek and Elvis. She played Yeoman Martha Landon (Chekov’s love interest) in the original Star Trek episode “The Apple.” Then in 1968 she played the part of Ellen in Live a Little, Love a Little. In the film Elvis picks her out of a crowd of girls at a pool party, sings “A Little Less Conversation” to her, and kisses her several times. That same year the National Association of Theatre Owners named her “Most Promising New Star of the Year.” Through the years she has appeared in dozens of movies and TV shows.